When companies are involved in local communities, they strengthen the people and groups around them and inspire employees. Mary O’Connor, founder of MOC&CO, lives out her personal mission to care about her community. She commits company resources – people, time, financial – fearlessly acting to improve lives around her. Such efforts get noticed. Shaw Media named Mary one of nine “Kane County Women of Distinction” and celebrated the women at a luncheon October 11, 2017. Speaking passionately at the luncheon, Mary mentioned groups she has supported for decades, like TAC House, a local group home for disabled adults. She also invited the audience to join We Can Lead Change Fox Valley. This group, created last winter, works to preserve and protect democracy. Their actions focus education and engagement with local elected officials. Mary also credited the MOC&CO team for delivering results that benefit others, illustrating the culture of community involvement in her business. Recently Mary challenged the St. Charles community to fill a semi-truck of supplies for Hurricane Harvey victims. With donations from people, businesses and clients around the U.S., the MOC&CO team filled the truck in September. St. Charles elementary students were collecting books for Houston kids and reached out to MOC&CO. “They asked if their books could hitch a ride on our truck – we said sure!” Contacts at the Houston Convention Bureau met and directed the truck to a local United Way site for distribution. Try Mary’s top suggestions on ways we can each get involved and inspired. Engage in random acts of kindness. “Every day, you can do this!” she said. “Encourage and support the people around you,” at work and in your personal life, when they work to improve lives. Like the other eight women honored, Mary O’Connor is leading change in Fox Valley, with her employees, for her clients, in her mission to advance people. Find out how to get involved with We Can Lead Change Fox Valley here. Learn about the outstanding home the Association for Individual Development has created for disabled adults at the TAC House, and see if you can support the association. And follow your passion to get involved in your community. 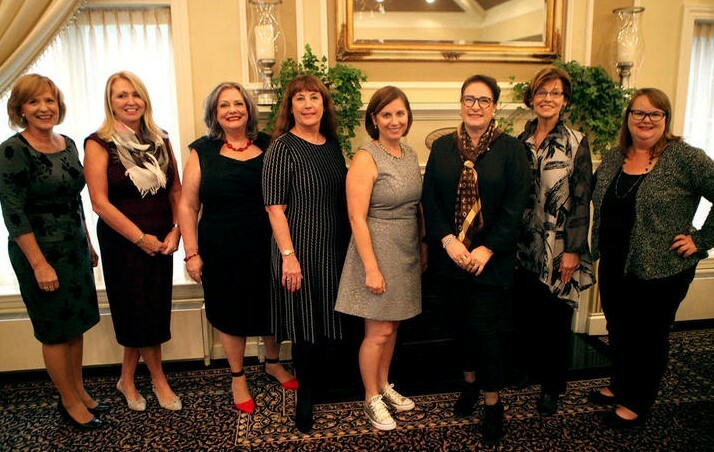 Photo: Mary O’Connor (fourth from left) and the Kane County Chronicle 2017 Women of Distinction take a moment to mark the event at the awards luncheon.